Ubisoft’s mostly annual Assassin’s Creed series is taking next year off, CEO Yves Guillemot said in an interview with Gamespot. Guillemot said “we are not going to have a full-fledged Assassin’s next year” and explained that the publisher will instead focus its efforts on developing new content for Assassin’s Creed Odyssey, which is scheduled for release on Oct. 5. Assassin’s Creed returned in 2017 with Origins, a well-received game that was strongly supported with post-release content for the better part of a year. According to Eurogamer, Ubisoft may have something similarly substantive for Odyssey, with a rumored Atlantis-themed expansion in the works. This year’s Assassin’s Creed Odyssey takes the series to ancient Greece. It stars Alexios and Kassandra, a pair of Spartan warriors, and will include a strong role-playing element through dialogue choices and customizable combat with an expanded skill tree. Probably for the best. Yearly franchises tend to lose their impact. Haven't been this hype for an AC since AC3 (which ended up ultimately being dissappointing). I can't deal with all the games coming out in the next couple of months though. D2: Forsaken, Spiderman, Dragon Quest, Odyssey, Red Dead 2. What the actual ****. What's kept you invested in Destiny 2? Are you going to get the Year 2 season pass? Several things, previous investment which includes friends, clan mates, love of the original game. That said, I take regular long breaks from Destiny whenever I get burned out on it. Once the D2 honeymoon phase ended and all my friends quit I essentially dropped the game until Warmind came out and Bungie began fixing its mess. It's still a work in progress, but Forsaken actually looks really good with the opening of weapon slots and the return of random rolls, essentially Bungie have spent the year from May onward slowly readding features from the original that they never should have removed. They're also improving their communication with fans although they are no Digital extremes. To answer your other question, no. I haven't even pre-ordered though I probably will pick it up before launch. The season pass doesn't appeal to me in the slightest after the debacle that was Curse of Osirus. As far as I'm aware, the two releases are small pieces of non story content. I need way more information than that before I plonk money for them. If its anything like the first two expansions, Bungie has no idea what that content even is yet. Ancient Rome will very likely feature at some point, it's too obvious to overlook that. Although of course Origins took place during the roman era, just not in Rome itself. Anyway, this game looks great. The classical era is my favourite historical time period so the more the merrier. Fallout becomes less of an RPG by the year while AC becomes more of one. Fallout becomes less of an RPG by the year while AC becomes more of one. This is 100% true, it's quite uncanny. I wouldn't be surprised. They'd have so many art assets that they could just copy-paste from the Ancient Egypt and Ancient Greece games. PC specs for AC: This is Sparda. Less than a month until release! We are very pleased to share with you today some more information on the PC specs for Assassin's Creed Odyssey. 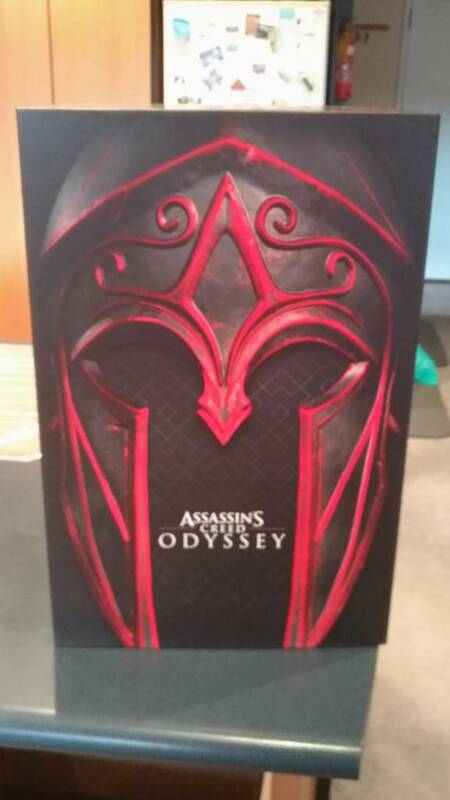 As was already the case for Assassin's Creed Origins, the PC version is not a port of the console versions of the game, but a tailored experience developed by a dedicated team at Ubisoft Kiev in close collaboration with Ubisoft Québec, the lead studio on Odyssey. Having a dedicated team on the PC version allows us to offer the level of customization that PC players expect, which will enable them to adapt the experience to their PC configuration. The PC version of Assassin's Creed Odyssey will also include unique features not found in the console versions, such as benchmark tools to test the different graphics settings, and a toggle option for dynamic resolution rendering to uncap the framerate. AMD Radeon R9 285/R9 380/RX 460/RX 560 or better, AMD Radeon 200/300/Fury X/400/500 series, Radeon Vega series: RX Vega 56 or better, NVIDIA GeForce GTX 660/760/950/1050 or better, GeForce GTX 600/700/900/10-Series series. Assassin's Creed Odyssey launches on PC, PS4, and Xbox One on October 5. For more information on the game, check out our previous coverage. Wow this one crept up on me! Looking forward to release - I should be able to pick up Origins pretty cheaply! Its weird that AMD FX still gets support. Looking forward to it. I think it's bizzare that they released the gold edition 3 days earlier then the std edition. It's the new pre order bonus. Thats what companies are doing now. Watched one or 2 reviews of this. Looks like another good Assassin's Creed game with the same fighting mechanics as Origins which I enjoyed. I'll pick this up on Friday. What do you do for a living brah? OMG, this is playable NOW for Aus/NZ customers!